It has been a while since we posted a sweater pattern on the blog, so being that it’s the middle of September, it feels as though the time has come. All of us knitters are dreaming of cooler days and crunchy leaves (some quite happily, some might consider these dreams to have more of a nightmare-ish quality to them), but perhaps the thought of a new knitting pattern might help ease the pain, for those that are mourning the loss of Summer. Should you not be such a fan of wool, worry not! Cascade has got you covered. Have a look at the Cascade Pacific, or Cascade Cherub Aran. All of these yarns will work to the same gauge as the sweater requires, are well priced, and also have a great selection of colours to choose from. Just remember however, that no matter what yarn you decide to go with- make sure you SWATCH! 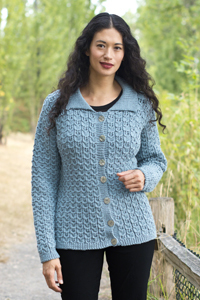 This cardigan is a classic, and will hold the interest of most any knitter. It is a great pattern for early intermediate knitters to jump into to learn a few new techniques, and is also great for the more advanced knitter, looking for a little something to hold their interest, but not hurt their brain. To get your hands on this fabulous pattern, click here.